There’s this word that I’ve been saying too often this summer, and it’s starting to get on my nerves, actually. My kids swear the word is evil, and it does leave a bad taste in my mouth when I say it, sometimes bitter, like regret, sometimes saltier, like anger. Sometimes, when I have repeated it more than a few times in five minutes, it tastes a bit like exhaustion. It’s a little word, just two letters, yet it holds extraordinary power. According to my kids, this word alone has propelled me to “the meanest mom” and “the worst mom” on multiple occasions – not just in our neighborhood, mind you, but in the whole entire world. It’s okay, though. I have thick skin. I can take it. But I know that they are tired of hearing that word, the one that begins with N and ends with O. I know that NO gets old, and I have to confess that sometimes, a lot of times, I just hate to say it, too. And that’s just before lunch . . .
My sons, particularly my soon-to-be sixth grader, are struggling with NO – and I get it. I really do. It’s hard to be the kid whose mom says NO regularly. NO is not cool. It hurts your image. It reminds you that even though you feel like you are old enough to make your own decisions, someone else is still (sort of) in control. But while my guys think that I don’t understand, that I don’t empathize with them, the truth is that I do. We actually have a lot in common. It’s hard to be the kid whose mom says NO. But it’s hard to be the mom who says NO, too. My boys don’t understand the social dynamics of NO, the way that other moms think I am judging their decisions when I say NO to things that they allow. My guys don’t know how heartbreaking it is to see them excluded from something or how difficult it is to find the sweet spot between “does-that-kid-even-have-parents?” and “that-mom-needs-to-cut-the-cord.” They don’t realize that it is painful, that it literally hurts, to deny them something that I know they really want, even when I know it is the right decision for our family. My oldest can’t yet comprehend that, even though I trust him, experience has taught me that there are temptations that he is not ready to face as a preteen. That there are people who seem trustworthy who should not be trusted. That even though he thinks he has seen everything, there are things that he has not seen and is not ready to see and if I could create a world where he would never ever see them, I would do that. They think my job is easy. They imagine that I retire to my room after saying NO, reveling in some kind of sinister satisfaction, gloating with an evil laugh. (Bwahahahaha!) I am the villain in the script, the one with the kryptonite, always thwarting their plans. But it just isn’t true. Maybe someday I will look back and wish that I had not said NO as often. Maybe, when they are all grown up, my kids will still insist that I was too strict. Maybe they will entertain everyone at the holidays with embarrassing stories about my husband and me, about how we REALLY were the meanest, most awful parents. Maybe, and this is where it gets really frightening, it will all fall apart, and they will blame our parenting for their own bad choices and rebellion. Or maybe they will thank us. Maybe they will appreciate just a little bit more the very word that they hate. Maybe they will feel grateful, as I feel grateful to my parents, who loved and trusted me but did not shy from saying NO. Maybe someday they will understand. It’s a gamble, really, a risk that we all take in those weird years between helping our children order from the kids’ menu and taking them to get a driver’s license. All parents walk the same wire, seeking a safe balance between being overly strict and being too permissive. There is no simple answer, no decision that fits the needs of every child or every family, but the compromise in our family is that even though we do say no often, we always say yes more – yes to fun, yes to adventures and time with friends, yes to building character, yes to hugs, yes to trying new things and facing our fears, yes to family, yes to celebrations, and yes to love. 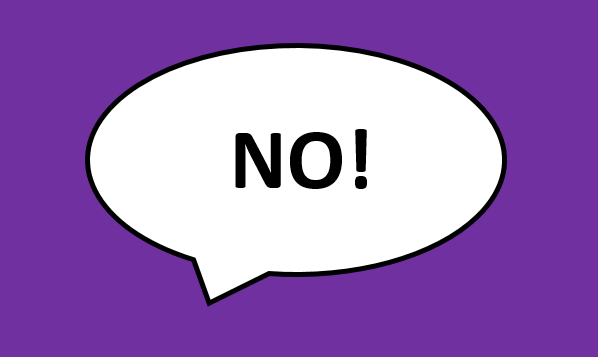 And when I feel uneasy about denying my children something, I remind myself that every NO is just a YES, really. It’s a yes to the values that I want to instill in the men I am raising, a yes to protecting them just a little bit longer, a yes to allowing them to earn the responsibilities and privileges that they think that they deserve. Saying NO isn’t easy. It’s a word that hurts sometimes. I know, because it hurts me, too. But when I say NO to my sons, it really means I LOVE YOU, and I hope that they will understand that, eventually, maybe when they have the honor of being “the meanest dads in the whole entire world” themselves. I love this, Mary Ann! It is amazing how early on in the parenting journey I find myself thinking hear same things (except they don’t talk back…yet). Really related to this, Mary Ann! The older Grant gets, the harder it is for him to understand NO because all of his friends are being told YES. We are sticking to our guns though and hopefully he too will be the meanest dad on earth someday too! Oh I remember how mean I was–I will never forget how you wanted to move in with Linda, because “she was the nicest mom in the world”. It is gratifying to have your kids come back as adults and express to you how much they appreciate your “meanness” now that they are all grown up and experiencing these challenges with their own kids. Love you.